Trials and tribulations of running our award-winning Eco-accommodation in West Waterford, Ireland. Types of Renewables which are Relevant to the Small Business. The Green Flower Award – criteria. 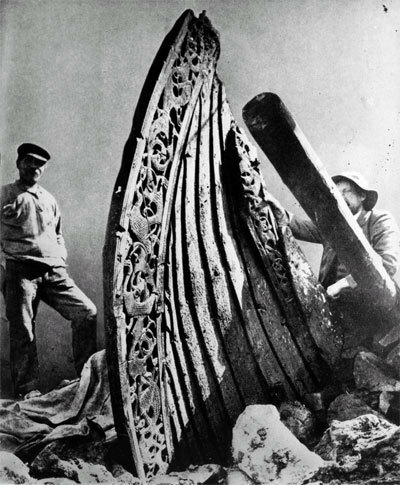 In 1904 a remarkable archaeological site was uncovered at Oseberg, Norway. It consisted of an astonishingly well-preserved Viking ship that contained the remains of two women along with a wide array of accompanying grave goods. This vessel, which is widely celebrated as one of the finest finds of the Viking Age, had been buried within a large mound or haugr. The burial mound measured approximately 40m long by 6.5m high and it completely covered the boat. The conditions within the mound were particularly damp and this meant that the ship and its contents survived nearly intact. 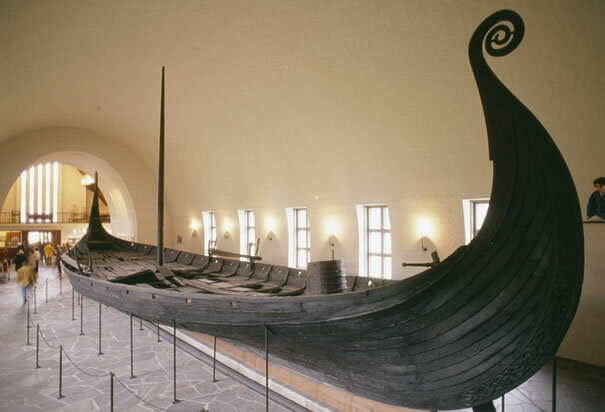 Constructed primarily out of oak planks, the vessel measured 21.40m long by 5.10m wide[i]. Its bow and stern were covered in elaborate carvings, while it contained 15 pairs of oar holes which meant up to 30 men could row the ship as required. Centrally placed on the ship were the skeletons of two women whose remains had been placed in a specially built wooden tent. One of the woman was in her eighties[ii] and this was reflected in the condition of her bones which showed that she had suffered badly from arthritis during her final years. The second woman was younger and had died in her early fifties[iii].The connection between the two women is unclear; it is possible that they were related or more sinisterly represent the remains of a noble woman interred with her sacrificed slave. Indeed, some have speculated that one of the women may be Queen Åsa, the grandmother of Norway’s first king, although this remains unproven. Radiocarbon analysis of the women’s bones indicated that they died c. 1220±40 and 1230±40 before present[iv] and this ties in with the dendrochronology dates from the burial tent timbers, which indicate it was constructed in 834 AD[v]. Other skeletal remains found on the ship included 13 horses, 4 dogs and 2 oxen. It is likely that these represent animals that were sacrificed to accompany the female burials into the afterlife. The grave was disturbed in antiquity and any precious metals that may have been present were stolen. However, a remarkable collection of wooden and textile artefacts were left behind by the grave robbers. 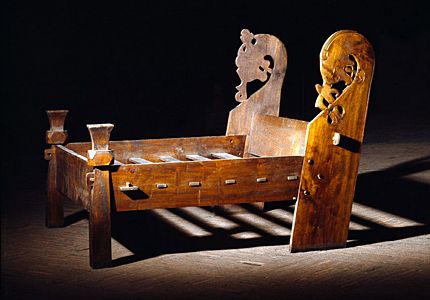 These included four elaborately decorated sleighs, a richly carved four-wheel wooden cart, three beds as well as a number of wooden chests. More mundane items such as agricultural and household tools were also found. This bucket was one of several found on on the ship. Made out of yew wood it is surrounded by decorative brass fittings and held together with iron hoops. A wooden ladle and 6-7 wild apples were found inside it. The famous Oseburg ‘Buddha’. Sitting in the lotus position this stylised human figure is found on another bucket from the ship. 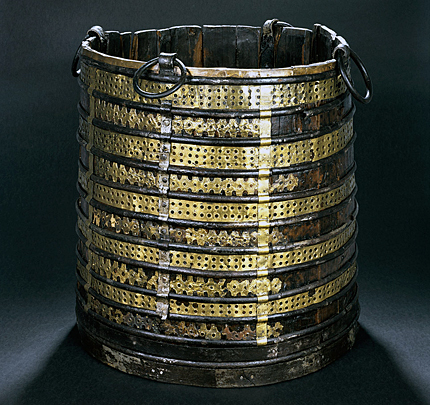 This bucket most likely originated in Ireland as the decorative motifs on the ‘Buddha’ are paralleled in Irish art work most noticeably The Book of Durrow. 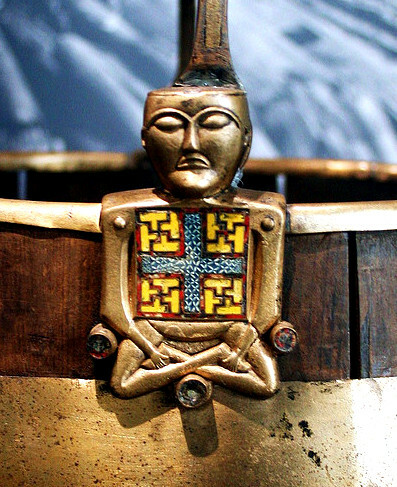 This suggests that bucket may represent booty captured during a Viking raid on Ireland. 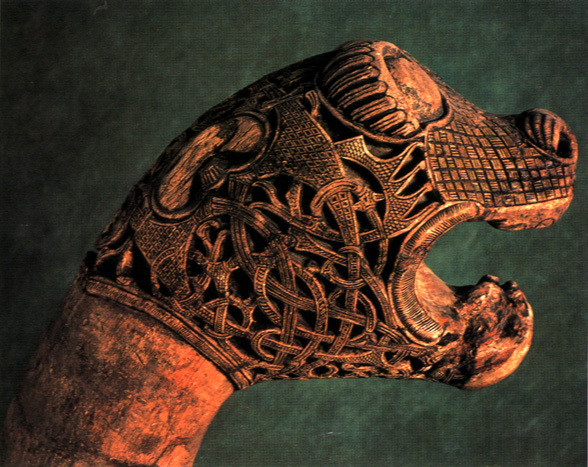 Five of these zoomorphic posts, all carved with different animal heads, were found in the Oseberg burial. They are fashioned out of maple wood and are of similar size. The posts contain slots for handles suggesting that they were originally carried and it is likely they had some sort of magical or religious significance. 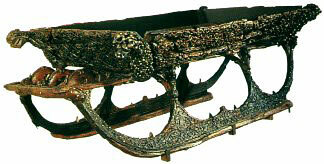 Four wooden sledges were also uncovered, three of which, were covered in ornate carvings. 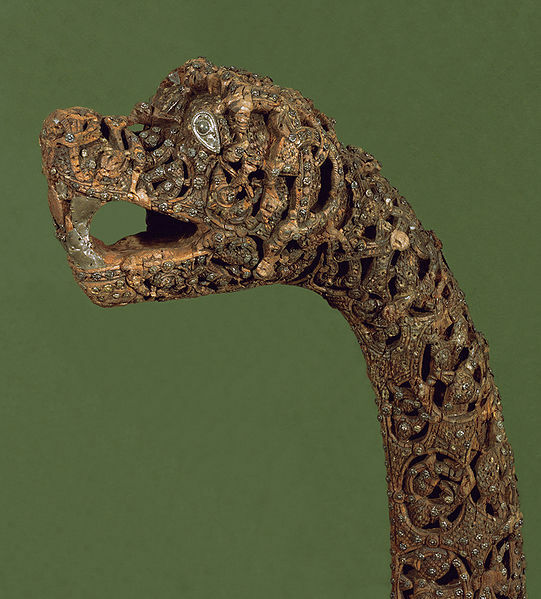 The Oseberg ship and its treasure trove of artefacts are currently on display at the Viking Ship Museum, Oslo, Norway. [i] Nordeide SW. 2011. Death in abundance quickly! The duration of the Oseberg Burial. Acta Archaeologica 82(1):7-11. [iv] Holck P. 2006. The Oseberg ship burial, Norway: New thoughts on the skeletons from the grave mound. European Journal of Archaeology 9(2-3):185-210. [v] Bonde N, and Christensen AE. 1993. Dendrochronological dating of the Viking Age ship burials at Oseberg, Gokstad and Tune, Norway. Antiquity 67:575-583. Posted in Education, History, longboat, Medieval, ship burial, Viking. Bookmark the permalink.